This is a static provider that allows access to historical data stored in Excel 97/2010 files (XLS and XLSX formats). It can be helpful to quickly browse an occasional Excel document without having to export its data to CSV. Read a special note at the bottom regarding XLSX files. Important: On 64-bit operating systems (x64), installed Microsoft Access Database Engine 2010 Redistributable is a prerequisite. If you plan to use 64-bit WL6 on a 64-bit OS, please download and install AccessDatabaseEngine_X64.exe, if you need to get back to using 32-bit WL6 on a 64-bit OS, uninstall the 64-bit ACE (Access Database Engine) and install AccessDatabaseEngine.exe, andd vice versa. Both drivers can not be installed and used simultaneously. The Excel provider will not work on x64 systems if no ACE 2010 driver was installed. Finally, Access Database Engine 2007 is not suitable as it doesn't have a 64-bit driver. Point to an Excel 97/2010 (XLS/XLSX) file by clicking on the "File..." button. The checkbox "Header in first row?" should be enabled if the first row contains column names e.g. "Symbol", "Date", "Open", "Close" etc. and cleared if the spreadsheet contains data only. If you've modified this checkbox by mistake, you will need to select the Excel sheet again. After setting the checkbox, select an Excel sheet containing DOHLCV data. Select the column containing symbol name(s). This will populate the preview box on the left. Finish the DataSet creation by assigning proper columns for Date, Open, High, Low, Close and Volume (custom series are optional). Make sure the data types are assigned properly! If you've modified ""Header in first row? ", you will need to select the Excel sheet again. A single column can be defined as custom data series and accessed with Bars.FindNamedSeries in a WealthScript Strategy. Your data should be contained in a single Excel sheet. 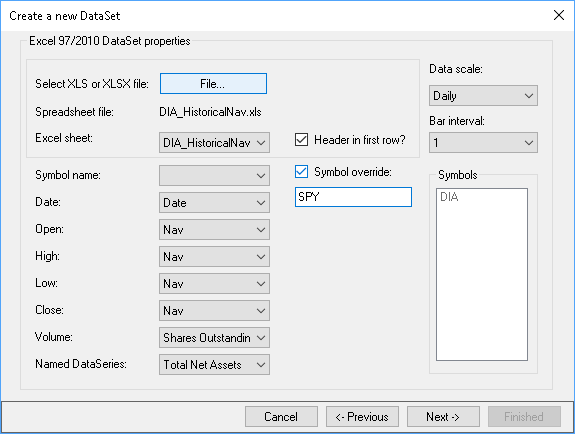 Although multiple symbols are supported, you'll need to create a DataSet for each symbol if the data for the symbol is contained on a separate Excel sheet. For the provider to support Excel 2007/2010 (XLSX) files, make sure you installed the free Microsoft Access Database Engine redistributable 2010 (32-bit or 64-bit version).